India observed the 50th Death Anniversary of former Prime Minister Lal Bahadur Shastri on January 11. His son BJP leader and former Rajya Sabha MP Sunil Shastri who was in Goa, spoke to Gomantak Times reporter Mayank Jha regarding the achievements of his father who coined the famous slogan ‘Jai Jawan Jai Kisan’. A documentary on the life and work of the second Prime Minister Lal Bahadur Shastri is being made and will be released soon. MAYANK JHA: What’s your thought on Lal Bahadur Shastri’s career? As a son what was the most influential thing about your father? 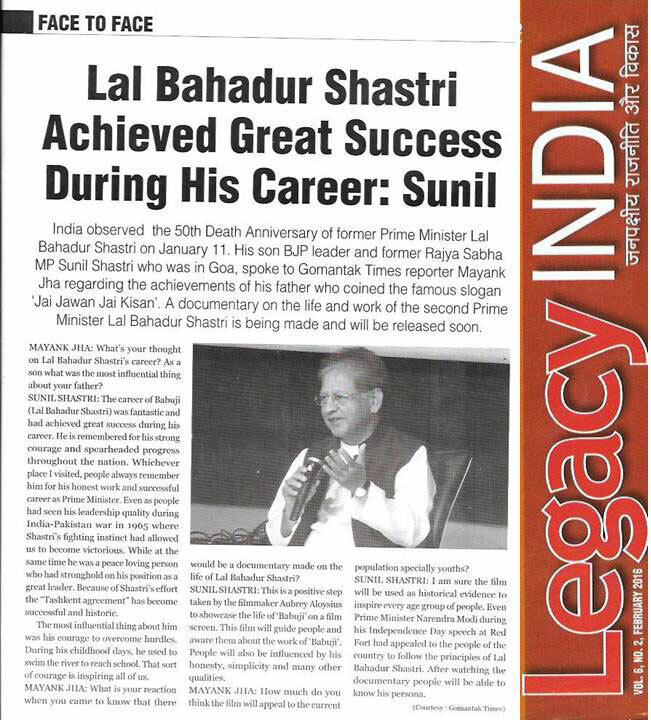 SUNIL SHASTRI: The career of Babuji (Lal Bahadur Shastri) was fantastic and had achieved great success during his career. He is remembered for his strong courage and spearheaded progress throughout the nation. Whichever place I visited, people always remember him for his honest work and successful career as Prime Minister. Even as people had seen his leadership quality during India-Pakistan war in 1965 where Shastri’s fighting instinct had allowed us to become victorious. While at the same time he was a peace loving person who had stronghold on his position as a great leader. Because of Shastri’s effort the “Tashkent agreement” has become successful and historic. The most influential thing about him was his courage to overcome hurdles. During his childhood days, he used to swim the river to reach school. That sort of courage is inspiring all of us. MAYANK JHA: What is your reaction when you came to know that there would be a documentary made on the life of Lal Bahadur Shastri? SUNIL SHASTRI: This is a positive step taken by the filmmaker Aubrey Aloysius to showcase the life of ‘Babuji’ on a film screen. This film will guide people and aware them about the work of ‘Babuji’. People will also be influenced by his honesty, simplicity and many other qualities. MAYANK JHA: How much do you think the film will appeal to the current population specially youths? SUNIL SHASTRI: I am sure the film will be used as historical evidence to inspire every age group of people. Even Prime Minister Narendra Modi during his Independence Day speech at Red Fort had appealed to the people of the country to follow the principles of Lal Bahadur Shastri. After watching the documentary people will be able to know his persona.